Truth can indeed be stranger than fiction, otherwise how to explain two murderous London gangsters becoming legendary household names after courting publicity and mixing with celebrities, then, when finally incarcerated, making more money in jail than out by selling T-shirts, mugs and other merchandise with their pictures on? Identical twins Reg and Ron Kray, born in 1933 in Hoxton, London, were boxers and National Service absconders before turning to full-on crime through protection rackets, armed robbery, gambling and murder. Both men were prone to violent outbursts and they established themselves as London’s most notorious gangsters in the 1950s and 1960s. They and their gang, “the Firm”, ruled an East End crime empire built on fear. Reg and Ron, or Reggie and Ronnie as they were also known, did short spells of “bird” in “the nick” but the police were unable to pin a big one on them, The twins felt that they were untouchable, intimidating witnesses so that no one would “grass”. In fact, back in 1952 the twins had been held in the Tower of London for a few days after failing to report for National Service. They were among the last prisoners ever to be held in the Thames-side fortress. All during the 1960s their names appeared in headlines as they escaped serious justice while flouting the law and mingling with the rich and famous in nightclubs. They appeared on the BBC to talk about their nightlife activities, and leading society photographer David Bailey took what would become iconic images of them. They achieved flash-bulb status while hiding behind their “legitimate businesses” and charming grins. Diana Dors, Frank Sinatra, Barbara Windsor and Judy Garland were among the entertainers they knew, along with politicians and television celebrities. Rival gangs operated in other areas, leading to “tooled up” confrontations, and police finally caught up with Reg and Ron, now 35 and infamous, after the murders of Jack “the Hat” McVitie and George Cornell. Cornell was another English criminal, a member of the Richardson Gang who was brazenly shot in the face and killed by Ronnie Kray in front of a barroom of drinkers at the Blind Beggar pub in Bethnal Green, east London, in 1966. Even so, everyone told the cops they were looking away at the time and didn’t see a thing, guv. McVitie was a gangland enforcer and hitman for the Krays but after he botched a job he was lured to a party and stabbed repeatedly in the face, chest and stomach by an incensed Reggie in 1967. One story was that McVitie’s liver came out in the frenzied attack and had to be flushed down the toilet. Accomplices cleaned up the mess but failed to dump the body properly. They were supposed to drop it off a railway bridge, so that it would be mutilated by trains but instead left it outside a church. Under twins’ orders the corpse was retrieved and has never been discovered since. The Krays continued to believe that they were invincible even while they went on trial for murder at the Old Bailey in 1969 after the dedicated efforts of police led by Detective Superintendent Leonard “Nipper” Read. The Krays put on a bit of a show in the dock and still thought they would get off. Then the police produced the Blind Beggar barmaid. One of the Krays’ “codes” was not to hurt women, children and the elderly, and initially the barmaid had merely been “strongly warned” to say she was “in the cellar” when Ron stormed in with a gun and murdered Cornell in cold blood in public. Now the police had got to work on her, and she admitted she wasn’t in the cellar. After her damning eyewitness testimony she started a new life in a new area with a new identity under police protection. Criminal hindsight was that the Krays should have done away with her earlier for once and for all. Other criminal accomplices of the Krays were also persuaded by the police to turn state’s evidence. Some stayed loyal and went down with the Krays. At the age of 35, the twins had once called all the shots in East End gangland but now they still had the second half of their lives to live – all of it, behind bars. That brings the Kray story up to date so far., whereupon David Meikle and Kate Beal Blyth take over. Meikle is a TV scriptwriter and “Sunday Times” bestselling author. Blyth produces true-crime documentaries. 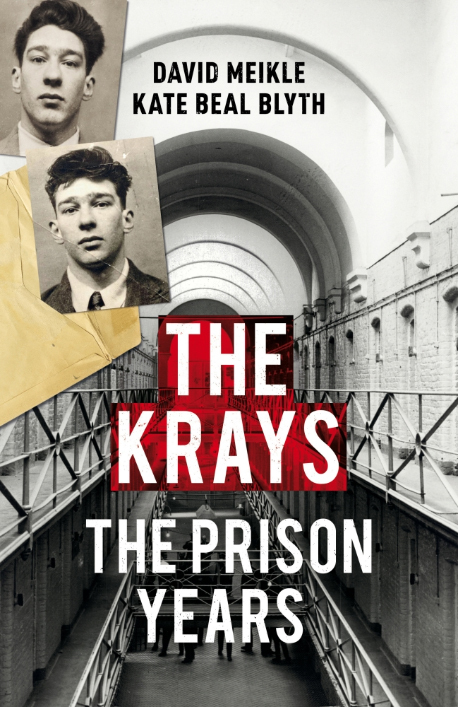 Theirs is the latest of many many books, and films, to appear about the Krays, who continue to hold a fascination for the people of Britain. “Hell” and “hellhole” are the words most widely used to describe prison in their book. Reg and Ron were Category A prisoners, usually housed in different institutions to each other and often moved around between jails to prevent possible escape bids. Ron was a chronic paranoid schizophrenic and homosexual, who ended up in Broadmoor, for the criminally insane, where detainees were “patients” rather than “inmates” Reg was bisexual and did heavy time in the foreboding Parkhurst prison on the Isle of Wight. At one stage he was transferred between six geographically-diverse prisons in quick succession – a move his friends and family believed to be part of the judicial system’s ploy to break his spirit. There is depression and attempted suicide. But also inmate “butlers” and “valets” who attended to the twins’ needs and protection from young punks who thought they could make a name for themselves by slicing a Kray. Later, not required to wear a standard issue prison uniform, Ron could meet the sartorial standards of his street attire, even behind bars, and he wore Giorgio Armani suits, tailored shirts and silk ties, immaculately dressed like a Harley Street doctor. Quality food, fine bed linen and LP records were SSbrought in by visitors for the Krays. And so it goes on. On March 17, 1995, Ronnie died age 61 of a heart attack while still locked up. His twin was briefly released on compassionate grounds in late 2000 after it was discovered he had bladder cancer. He lived out his few final days in a hotel suite before dying on October 1, 2000. Meikle and Blyth have a rich subject and it is an absorbing read.